This evening's music features blues singer and harmonica player Buster Brown. Enjoy! "The mythology of the Reagan presidency is that he induced the collapse of the Soviet Union by luring it into unsustainable military spending and wars: should there come a point when we think about applying that lesson to ourselves?" President Donald Trump's requested military budget is another record breaker—and Democrats are countering with their own increase. The Trump administration unveiled the details of its proposal to the public on March 12. At $750 billion, the military seeks to receive $36 billion more than last year's record $714 billion budget—an increase that experts say is aimed at China and Russia. Democrats have signaled that the increase is a nonstarter, but their counter-offer of $733 billion isn't exactly a difference in more than degrees, Matt Taibbi wrote in Rolling Stone. welcome. Across a number of major political blocs in Iraq, there is growing consensus that the US, and indeed all foreign military forces, need to go. Hawks are already trying to spin this, as with everything else that doesn’t go America’s way in Iraq, as Iran’s fault. ... In reality, the US and Iran have been backing the same parties in Iraq since 2003, and US discomfort with that fact has been consistently undermining their goals. Pfffttt! The Pentagon has "secret evidence" that it can't show anyone that they say exonerates them. The Pentagon has denied the findings of a new Amnesty International report that alleges that the U.S. military air campaign in Somalia has killed numerous civilians in the last two years. “Our assessments found that no AFRICOM airstrike resulted in any civilian casualty or injury,” U.S. Africa Command (Africom) said in a statement late Tuesday, referring to the strikes against the Islamic extremist group al-Shabaab. Amnesty International, a human rights group, released a report earlier on Wednesday that claims that in investigating more than 100 strikes in Somalia in the past two years, it found “compelling evidence” that five strikes have killed 14 civilians, including children, and injured eight others. Recognition of the Golan would also set a postwar precedent for endorsing the conquest of territory by force, and could pave the way for US recognition of Israeli sovereignty in the Palestinian occupied territories. In a recent state department report on human rights, the administration changed their description of the West Bank and Gaza from “occupied territories” to “Israeli-controlled territories”. Theresa May is facing a furious backlash from her own backbenchers and calls for her resignation after she blamed squabbling MPs for delaying Brexit. In a defiant statement on Wednesday night she told the British public: “I am on your side,” and now hopes to force her deal through parliament next week at the third time of asking. Corbyn accused May of having “no plan”, and embarking on a reckless course. “We are now in the midst of a full-scale national crisis,” the Labour leader said. Donald Tusk said that the EU27’s heads of state or government would be likely to agree in principle at the summit on Thursday to an extension up to 23 May or 30 June – but only if May could find a majority in the Commons next week. That sets up a nail-biting next few days, with Downing Street racing to win approval for May’s deal, and then hold a vote in both houses of parliament to change the exit date set in the EU Withdrawal Act. Even in a country long-used to violence, the cowardly 2017 murder of the Mexican journalist Javier Valdez prompted outrage: reporters held protests, news outlets stopped publishing for a day and the then president, Enrique Peña Nieto, promised that the crime would not go unpunished. But barely 10 days after Valdez was pulled from his car and shot dead, his widow Griselda Triana was targeted for surveillance with spyware which had been purchased by the Mexican government. A large majority of residents in the world's leading capitalist nations responded with a resounding "yes" to a survey asking whether they support hiking taxes on the rich to fund social programs for the poor. Most residents in all 21 countries included in the Organization for Economic Co-operation and Development (OECD) survey published Tuesday said their governments should "tax the rich more than they currently do in order to support the poor." In the United States, over 50 percent of those polled said they support hiking taxes on the wealthy to help the poor. Average support for the idea among all 22,000 people surveyed was at 68 percent. The OECD survey comes as U.S. members of Congress and presidential candidates are advocating a variety of proposals to increase taxes on the rich—including a wealth tax and a 70 percent top marginal tax rate on Americans making over $10 million per year. The phrase “hard-line,” as commonly used in the Washington Post, is almost always a pejorative. Often it references official enemy states like Iran (5/4/18, 5/9/18) or North Korea (1/18/19). In a recent Post (3/11/19) article, however, reporter Paige W. Cunningham used the term to refer to a different kind of enemy: proponents of Medicare for All. Among the “hard-line liberal groups and unions” the article refers to in its headline and lead is the Consortium of Citizens with Disabilities, a coalition of approximately 100 national disability organizations. The “hard-line” groups include much of the grassroots movements for healthcare justice in the country: National Nurses United, Social Security Works and the Center for Popular Democracy. These orgs—described elsewhere in the piece as “advocates on the far left”—are devoted to such “hard-line” positions as universal healthcare, protecting senior citizens and empowering voters and activists. The Post is concerned that these groups provided input to Rep. Pramila Jayapal as she wrote the Medicare for All legislation (H.R. 1384) she introduced in February. In fact, what the Post describes as “hard-line” and “far left” is actually a very popular position. Medicare for All has long polled well among the public at large, especially Democratic voters. A Reuters poll from 2018 (The Hill, 8/23/18) showed 70 percent of the public, 85 percent of Democrats and 52 percent of Republicans support Medicare for All. That poll is the high water mark, but the policy polls well in most other polls as well (Politico/Harvard, 1/7/19). This popular support was not mentioned by the Post. In fact, the article asserted that the “bill would overhaul the US healthcare system so dramatically that summoning broad public support for it seems like a tall order.” Yet Medicare for All already has broad public support, despite its reputation on K Street and Capitol Hill—and, evidently, in the Washington Post’s newsroom. In a move policy analysts and progressives warned could drastically increase the risk of another financial collapse, two Democratic regulators appointed by Senate Minority Leader Chuck Schumer (D-N.Y.) joined their GOP colleagues in pushing the Federal Reserve to weaken safeguards that limit Wall Street's dangerous gambling. "At issue is the supplementary leverage rule, which was adopted in the aftermath of the 2008 collapse as a last line of defense against financial excess," HuffPost's Zach Carter reported Tuesday. "Four out of five top officials at the Commodity Futures Trading Commission want the Fed to lower leverage requirements by changing the way the officials treat derivatives." Rep. Katie Porter (D-Calif.), a member of the House Financial Services Committee and a banking regulation expert, condemned the plan to gut post-crisis protections as "another example of Trump regulators listening to Wall Street's wish list." The latest bipartisan deregulatory push comes just months after Democrats in Congress helped Republicans ram through legislation that significantly weakened the Dodd-Frank Act on the anniversary of the 2008 Wall Street collapse. The Los Angeles police commission ruled that officers violated policy when they fatally shot a 30-year-old man in the middle of a mall, a rare official rebuke of deadly force in a city with frequent killings by police. Police did not follow protocol when they fired shots at Grechario Mack, a 30-year-old father of two, while he was on the ground inside the mall amid a mental health crisis. Mack, who was shot in multiple places including the back, had been holding a kitchen knife and appeared agitated when officers began firing on 10 April 2018. The commission, a board that reviews police conduct, ruled that the initial shots were in line with policy, but that two officers violated protocol when they fired their final shots at Mack when he was already down. The Guardian chronicled Mack’s killing last year as part of an investigation into law enforcement in Los Angeles county, where hundreds have been killed by on-duty officers or died in custody since 2012, but none of the officers have faced charges. Last week, after the deadly mosque attacks in New Zealand, President Trump was asked whether he believed white nationalism was a growing threat. “I don’t, really,” he replied. “I think it’s a small group of people that have very, very serious problems.” Terrorism experts firmly disagree, pointing to data that says far-right extremist violence in the U.S. and Europe is becoming more frequent and potentially more deadly. But while other countries have taken significant steps to identify the threat and counter it through dedicated intelligence programs, the Trump administration has cut or cancelled initiatives that were designed to combat domestic extremism. Shortly after taking office, the administration defunded the Obama-era Countering Violent Extremism Program, which launched in 2016 and had allocated $10 million toward organizations fighting domestic extremism. In addition, the administration froze funds that had already been allocated, including a $400,000 grant for Hope Not Hate, a Chicago-based organization that deradicalizes neo-Nazis. Ardern expects the new laws to be in place by April 11. New Zealand will also ban parts used to convert regular weapons into MSSAs as well as all high-capacity magazines. Harvard University “shamelessly” turned a profit from photos of two 19th-century slaves while ignoring requests to turn the photos over to the slaves’ descendants, a lawsuit alleges. Tamara Lanier, of Norwich, Connecticut, is suing the Ivy League school for “wrongful seizure, possession and expropriation” of images she said depict two of her ancestors. Her suit, filed in Massachusetts state court, demands Harvard immediately turn over the photos, acknowledge her ancestry and pay an unspecified sum in damages. The suit attacks Harvard for “exploitation” of Renty’s image at a 2017 conference, among other uses. It said Harvard capitalized on the photos by demanding a “hefty” licensing fee to reproduce the images. It also draws attention to a book Harvard sells for $40 with Renty’s portrait on the cover. Mike Gravel was a Democratic senator from Alaska from 1969-1981. He’s currently 88-years-old and, reportedly, thinking about running for president. I am considering running in the 2020 Democratic primary. The goal will not be to win, but to bring a critique of American imperialism to the Democratic debate stage. The website (https://t.co/j5qZdJoH7S) is under construction. Official announcement will be in the coming days. That goal appears to be at odds with Schultz’s staffing decisions, given that Warren’s employer works for a multitude of special interest groups. Warren told The Intercept in an email that he is on leave from Hamilton Place and “focused full-time on Howard Schultz.” On Hamilton Place’s website, Warren is still listed as a partner, and his LinkedIn page states that both jobs are current. As the Texas Tribune correspondent Patrick Svitek reported, the comments came during an event at Keene State College in New Hampshire, after O’Rourke was asked about rumors that he had taken “pro-Israel lobbyist money” during his failed Senate run in 2018. O’Rourke explained that, in fact, he had taken no money from political action committees in that race — although J Street, a pro-Israel lobbying group that aids candidates who favor a two-state solution and oppose the Boycott, Divestment and Sanctions movement, helped solicit $170,000 in individuals donations to his campaign. “If you’re asking if the contributions I accept connect to the policies I support, the answer is no,” the former Texas Congressman replied, according to Paul Steinhauser of Fox News. In the first significant check on the Trump administration’s “energy-first” agenda, a US judge has temporarily halted hundreds of drilling projects for failing to take climate change into account. Drilling had been stalled on more than 300,000 acres of public land in Wyoming after it was ruled the Trump administration violated environmental laws by failing to consider greenhouse gas emissions. The federal judge has ordered the Bureau of Land Management (BLM), which manages US public lands and issues leases to the energy industry, to redo its analysis. The decision stems from an environmental lawsuit. WildEarth Guardians, Physicians for Social Responsibility, and the Western Environmental Law Center sued the BLM in 2016 for failing to calculate and limit the amount of greenhouse gas emissions from future oil and gas projects. The agency “did not adequately quantify the climate change impacts of oil and gas leasing”, said Rudolph Contreras, a US district judge in Washington DC, in a ruling late on Tuesday. He added that the agency “must consider the cumulative impact of GHG [greenhouse gas] emissions” generated by past, present and future BLM leases across the country. A coalition of environmental groups called out 33 global banks for collectively giving at least $1.9 trillion to fossil fuel companies since world leaders adopted the Paris climate agreement in December of 2015. The call-out came in Banking on Climate Change (pdf), published Wednesday as the tenth annual fossil fuel report card from the Rainforest Action Network (RAN), BankTrack, Indigenous Environmental Network, Oil Change International, Sierra Club, and Honor the Earth. "This report is a red alert," declared RAN climate and energy researcher Alison Kirsch. "The massive scale at which global banks continue to pump billions of dollars into fossil fuels is flatly incompatible with a livable future." "If banks don't rapidly phase out their support for dirty energy, planetary collapse from man-made climate change is not just probable," Kirsch warned. "It is imminent." According to the report, the top four funders of coal, oil, and gas companies from 2016 to 2018 were all U.S. banks: JPMorgan Chase ($195.66 billion), Wells Fargo ($151.6 billion), Citi ($129.49 billion), and Bank of America ($106.69 billion). Other major offenders included RBC ($100.54 billion), TD ($74.15 billion), and Scotiabank ($69.57 billion) of Canada; Barclays ($85.18 billion) of the United Kingdom; and Mitsubishi UFJ Financial Group ($80.04 billion) and Mizuho ($67.71 billion) of Japan. seemingly oblivious to the fact that it is decades after the infamous New Democrat William Jefferson Ronald Reagan Clinton gratuitously gutted the Glass-Steagall act, setting in motion the forces and actions that led to the above mentioned 2008 meltdown. pfah! not to mention wjrr clinton's perfidious act of supporting and signing the commodity futures modernization act which will similarly set the aforementioned forces in motion and enhanced the danger of the 2008 meltdown greatly. that clinton guy was a real winner weiner. Rarely are public opinion polls this accurate. No one can dispute the findings of this poll. 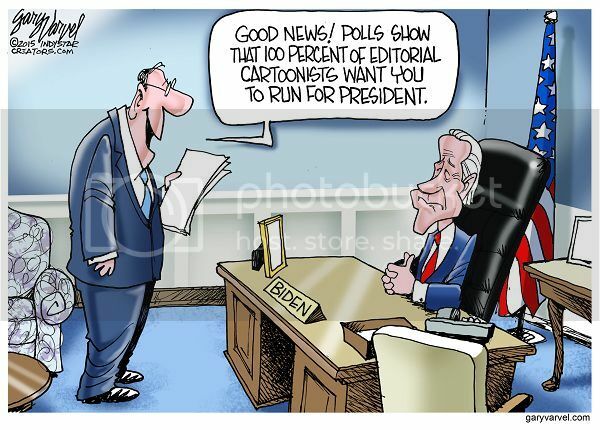 yep, if it's biden vs. trump in 2020, the cartoon and comedy industries are golden, they can't lose. The deer are cavorting in the back yard. The political allies are suggesting the goat runs for our district house seat. Oh dear. Hope y'alls making good headway. i like it. vote goat 2020. it's got a certain ring to it. I'm having day-jah-view ( ). If only I could remember what other administration shutdown a program to help stop the next white nationalist attack. Hmm. That's a thinker. DuckDuck, please help! The good people at the Southern Poverty Law Center reveal why disbanding a Homeland Security unit that tracked this phenomenon was a really bad idea. it's pretty sad how many of trump's awful policies are carry-overs from the obama administration. i guess it's hard to be a genuinely original "president evil" when there have been so many malevolent presences in the job prior. heh, that peter douche's liason puts out some good stuff. Horrifying scenes have come out of Iraq as what was supposed to be a festive event became marred by shock and tragedy, as at least 83 people drowned in the Tigris river near Mosul when an overloaded ferry capsized. An AFP report put the death toll at "almost 100 people" as the rescue operation continued into the night. Families and revelers were celebrating the Kurdish new year on Thursday, known as Nowruz, as well as Mother's Day (marked as March 21 in the Middle East), when the ferry began sinking down on one side before turning completely over, trapping men, women and children under the boat and in an unusually strong current. Have you heard about the refinery fire in Texas that is putting toxic fumes into the air and just a few days ago the authorities told people that it the air was ok? Oops. Turns out they were wrong about that and have now called in the national guard to keep people in their homes and out of the area. Wonder if the person who said that got advice from Christine Whitman? Remember when she said that the air at ground zero was safe to breathe? Then it took congress almost a decade to set up the fund for people who were dying horribly from breathing that air. I'm seeing lots of people saying that they are happy that Trump is rolling back regulations. Why? Because they place unnecessary monetary burdens on corporations. No I don't think that they are industry bots, just the regular airheads on my local news website. yep, i just put a story into tomorrow night's evening greens about the houston (deer park) refinery. now that the fire's out, it's no longer burning off the toxic chemical stew at the plant which includes lots of (cancer-causing) benzene. the benzene fumes are now spreading around at ground level in far more concentrated form - seriously endangering locals. nasty stuff. Man Buster could blow that harp... great stuff JS! So Trump just gets to decide it was OK for Israel to steal Syria's Golan Heights? Bezos and WaPo are truly the enemy of the people. Good call. Great to see Gravel out there pissed about the right things. Also great to see Bernie and Move on pass on AIPAC grovelling. after more than 80% of the people living there voted to go with Russia. And since Don is in Vlad's pocket I'm expecting him to say that Russia can have it any day now. Any day.. Saw one person saying that he would be upset about Israel taking the GH, but he's not because of Assad and Vlad. Great reasoning don't you think? Propaganda. It's what's for dinner. brown's harmonica style reminds me a lot of sonny terry (particularly the whooping that punctuates a some of his lines) and j.c. burris. great stuff! do you really think that there are enough congressworms that are willing to stand up and oppose him on this? he could really bring something to the debates. and it might keep the chattering classes clutching their pearls for ages. The Trump White House and the Social Security Administration (SSA) have a new scheme to expand the federal government’s ability to snoop on the social media accounts of disabled Americans. The plan, which appears in this year’s SSA budget proposal (and was first reported on by the New York Times), hinges on the government’s ability to scoop up pictures and posts that might reveal whether someone is faking a disability. The budget also calls for cuts to Social Security Disability Insurance (SSDI) — not the first such proposal under the Trump administration. The new program is designed to solve a problem — widespread disability fraud — that experts say does not exist. In fact, there is no evidence of such large-scale malfeasance. Trying to adjudicate disability by monitoring social media will be, at best, an exercise in bias confirmation and, at worst, will represent a major expansion of the surveillance state, focused on some of America’s most vulnerable citizens. Getting qualified for SSDI can take years even though people present with obvious qualifying disabilities on day one. Fraud does happen, but it usually comes from doctors who order unnecessary tests and procedures. Bill for higher than allowed and other things. Worker's compensation fraud is less than.02% by people who say they were injured, but that percentage goes way up when it comes to the insurance companies. Way up! just the sort of thing that repugs like to do. it's good propaganda for them even though they will spend far more money chasing the fraud that is purely a figment of their fevered imaginations than they will save when they catch a couple of people at it.